If you are looking to excel in your career, here are great tips to help you become much better in your field. 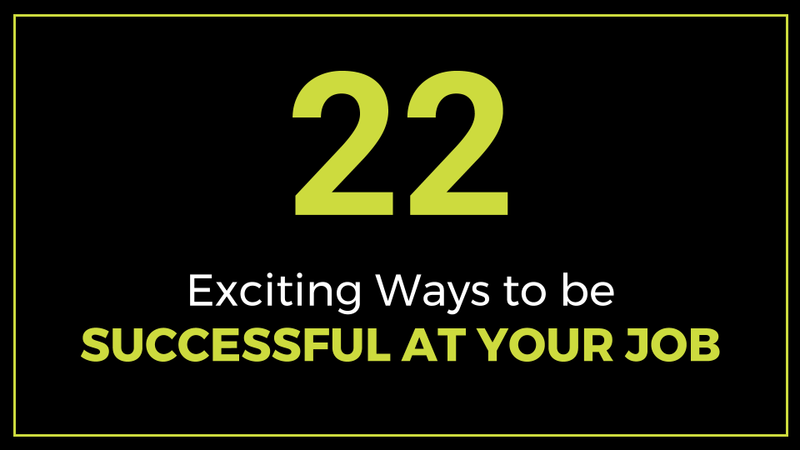 This article discusses 22 ways to be successful at your job. Being successful at your job is essential for your long term career growth. When you are hired as an employee in an organization, you typically get a job description which is a road-map that shows what roles and responsibilities you will be in-charge of and how these intersect with the overall goals of the organization. Once you start working, you will have the opportunity and capacity to either transform your position phenomenally or just ramble on by providing the bare minimum amount of effort necessary to receive a steady paycheck. By being internally motivated and staying aligned with the organization’s mission and vision, you can put to work the following 22 tips, strategies and tactics on how to be successful at your job. You can quickly skim all the 22 tips on the table of contents below and then click on any tip to read further details. For your additional convenience, there is a summary at the end of each tip. Please enjoy reading. Thank you. How Much Horsepower do You Bring to Work? Genuinely care about the well-being of the organization. Treat your organization as if it were your own company. Be passionate about doing good work for your employer. Give your best work and then give some more – go the extra mile. Do a good job all the time regardless of whether you get recognition or not. Your job is your domain, you should bring as much passion, energy and excitement to your job as you possibly can. As an employee, one of your aspirations is to have a job that you thoroughly enjoy and at the same you feel challenged, needed and get a sense of personal satisfaction from doing the job well. A few simple ways of demonstrating passion in your work include the following: start by loving what you do, take pride in doing great work, try a different way of doing routine tasks and think of how others benefit from the good work you do. Solve problems by thinking of new and creative ways to do tasks, have high aspirations, innovate, take smart risks, build on successes, laugh at yourself, enjoy each step of the process, learn from your experiences and connect with others. Other ways include set high standards of excellence for yourself, take initiative, be resourceful, exhibit confident body language, be determined, genuinely care about colleagues, help others to learn what you know, think excitement and reduce distractions to broaden your focus. Be self-driven, take baby steps to decimate big tasks, do your work with a good attitude, have goals for yourself, know what you excel at and keep doing more of it, seek inspiration and think of the end goal. Trust that in the circle of life, when you do good, your reward will come at the right time. In the short-term, your reward will be the personal satisfaction in knowing that you are giving the very best outputs and results that you can. Great passion also inspires others and collectively the team’s performance becomes much greater. Take control of your career by expanding your knowledge. Set aside time to read something new every day. Look for free online training courses for your professional development. Learn as much as you can about the big picture regarding the company. Be continuously hungry and curious about learning new things even in totally unrelated areas then develop the skill of connecting the dots on things that might seem unrelated at first glance but somehow there could be a bigger connection or hidden connection. Be proactive. Always think ahead, plan as best as you can then execute. Under promise and over deliver, think of solutions instead of problems, anticipate requests and questions from your boss and prepare for them, support your boss, give regular status updates and schedule regular check-in meetings. Develop resources that will help other staff such as manuals, writing down key steps and procedures for doing tasks, develop flowcharts and pictorials, and develop Standard Operating Procedures (SOPs) for tasks that you do on a routine basis. Train others on these procedures. Strive to automate your work processes by developing templates and forms for routine processes. These initiatives are especially useful when training new hires. Think of solutions instead of problems. Anticipate requests from your boss and prepare ahead. Organizations typically do at a minimum an annual performance review of individual staff, some organizations even do two semi-annual reviews and some do quarterly reviews. Likewise it is important to do self-evaluation at regular intervals to measure your progress and identify gaps in your plans. Be honest with yourself and at regular intervals ask yourself deep probing questions about what you have done, what did you want to accomplish, did you get it done, if not why not, how are you improving as an individual, how are you improving your organization? At what stage are you at in your career path? What is the ultimate destination that you envision for yourself career wise and how long will it take you to get there? When we make mistakes, the knee jerk reaction is to run and hide, cover up, make excuses, lie or deny. However, on the flipside you can learn a lot from mistakes and failure in fact they can be the foundation for future success. Directly inform your supervisor in a timely manner when you make a mistake. Do not blame others, apologize, reflect on the mistake and ask yourself what did I learn from this, how can I do it better next time and keep moving forward. As an employee, a key investment that you can do is to thoroughly study and learn your boss. Get to know your boss’ working style, preferences, strengths, weaknesses, and blind spots. Identify ways that you can further support the strengths and on the other hand find ways to turn the weaknesses to strengths or at a minimum mitigate the weaknesses. For example if your boss is not very keen or savvy in filing, come up with a user friendly easy to use filing system for your boss to use. If your boss is not good at preparing and circulating an agenda before meetings, seat down with your boss and identify the key things to discuss in a particular meeting then develop an agenda around this. Share the draft with your boss and circulate the final agenda to meeting participants at least one day before the meeting. You should avoid brown-nosing your boss. Have genuine and honest interactions with each other. Treat your boss with respect. Learn the communication style preferences for your boss. Does he/she prefer a detailed email or a brief email, do they need a detailed written report or a summary, do they prefer to chat by email, telephone or face-to-face? How often do they like to be updated – twice a day, daily, weekly, bi-weekly, monthly? Is your boss a morning person, an afternoon person or an evening owl? Learn as much as you can about your boss’ style, adapt to this style, keep him/her regularly informed and updated, offer your help when needed, ask for your boss’ guidance when you need it and then feed him/her with success. A happy boss equals a happy employee. Learn your boss’ working style, preferences, strengths, weaknesses and blind spots. Support your boss’ strengths, turn weaknesses to strengths or mitigate the weakness. Keep your boss regularly informed and updated. Ask for your boss’ guidance when you need it. 6. How Much Horsepower do You Bring to Work? In the wonderful world of cars, one fascinating fact of distinguishing the performance of one car from another is its horsepower. A typical and common selling point includes loudly proclaimed features such as a car which can go from 0-60 mph within the shortest amount of time. Conversely in your job, how much Horsepower do you bring to work? How much work can you do compared to others in similar roles as yourself? What is the industry average for peak performance in your role? What was your average work output one year ago as compared to your output now? Is your productivity increasing or decreasing? Strive towards becoming a topmost performer in your team who not only produces fast work results but also does it accurately and error-free to the greatest extent possible. Think like a CEO when at work. Enhance your visioning skills. Constantly imagine if you had just one idea that could transform your company, what would that idea be? Stretch your imagination. Think of new and unique ways that you can add value to your company and once you strike a golden idea, clearly write down that idea/proposal and present it to your boss. A written down, clear vision helps you to be organized and it helps in aligning short term-term and long term goals and activities. Care enough about your company to visualize ahead to five or ten years; What would the business landscape look like? How will we cope? What are the evolving trends? What new ideas would be needed to keep your company relevant and competitive? How can we keep and retain many customers? Visualize 5-10 years ahead: What will the business environment look like? How will we cope? Workmates are a definite source of knowledge; some work colleagues are literally ‘human libraries’ who are smart, talented and skilled in various professional areas. One easy way to increase your knowledge base and skills in areas where you are weak is by identifying a work colleague who has great skills in a specific area and learning from them. It could be skills such as spreadsheets, customer service, programming, closing sales, accounting, negotiating, presenting, marketing etc. Approach your colleague and in a sincere way say that you admire their skills in area x, y or z and that you would be grateful if they could spare some time to train you a bit on their skills. Once you have both scheduled a mutually convenient time, you can learn first-hand from your colleague or colleagues and thereby improving and increasing your job skills in the process. As a way of giving back and ‘paying it forward’, you can train others and share your skills to benefit other colleagues as well. Some work colleagues are literally ‘human libraries’ with vast knowledge and many years of experience. You can test-drive your leadership skills while you are in your current position by volunteering for opportunities to lead small meetings, opportunities to organize events and workshops, and opportunities to make oral presentations. By doing these activities you can sharpen skills such as communication, coordinating, negotiating, managing, decision-making, time management, resources management, conflict resolution, directing and even supervising. Also look for opportunities to help out in research and data gathering/collection. In addition, help out in writing reports even if it is just developing the first draft of a report. Learning how to prepare a budget is an added advantage. Research, report writing and budgeting skills are additional assets to master in your quest to become successful at your job. One more asset to add to your collection is to learn how to read and interpret financial statements. Test-drive your leadership skills by leading meetings, organizing events & oral presentations. Nobody likes to work alongside an arrogant, proud, braggadocios or boastful person. Humility is an important virtue. Being humble goes a long way in solidifying your character and how you interact with colleagues. The foundation of humility stems from self-awareness and understanding your strengths and weaknesses. The very thought and knowledge that you cannot do everything and that you don’t know everything, is a humbling thought that should help you to stay even-keeled and respect others for their unique skills and contributions. Recognize that no one is perfect and that we all have our limitations. Empathy is all about putting yourself in other people’s shoes. Cultivate empathy by learning to let go of your ego and see things from other people’s point of view. Share credit with other people, be genuinely interested in others, ask others for help and advice when you need it, collaborate with others, cultivate a pleasant personality, be open to learning, be vulnerable and pay attention to others. Say I’m sorry when you slip-up, do not be afraid to say you don’t know and finally treat others the same way you would like to be treated. Of course you should not be a doormat that others can walk all over on. Know your limits and boundaries and assertively communicate this. Always strive to be kind. Help others whenever you can without expecting anything in return. Keep planting these good seeds. Use common courtesy words such as please, thank you, and excuse me. Avoid gossiping, respect other people’s time, avoid never ending complaints, be happy for others, respect the opinions of others, and give others your full attention by not texting or typing when they are talking to you. Finding a mentor is a great investment. This is a person who has already been there and done that and can offer you career advice and guidance based on real-life experience. A mentor can be able to identify your blind spots and help you to navigate your career and office politics. A mentor will help you to think critically, challenge your assumptions and push you to think bigger and better. If you are lucky enough, your organization might already have a mentorship program where typically a junior staff is paired with a senior staff member. You can also identify a senior staff member who you respect, admire and believe can add value to your career growth and request them to take you under their wing as a mentee. Build a relationship of trust with your mentor and be open to receiving constructive criticism that is aimed at making you a better person. An ideal mentor should be one who is available for you and encourages you to ask him or her lots of question especially about their own career story. How did they start out in the career, what challenges did they face, why did they choose this career, what advise do they have for an ambitious professional etc. You can also look for a mentor outside your organization. Identify your own criteria for who you would like as a mentor and then set out to knock on doors to establish a mentor-mentee relationship. Introduce yourself through email or telephone, schedule an initial face to face meeting, discuss what you hope to gain from the relationship and set-up mutually agreed targets and regular intervals for check-in/progress meetings. An additional option is to identify a virtual mentor. This can be a well-known scholar, an author, an executive etc. and usually this person has written books and produced audio CDs and videos of their teachings. Read their books, listen to the audio CDs and watch the videos for ongoing inspiration. Similarly, read widely about successful people and learn the habits that they employed to become successful in their careers. If you are open minded enough, you can likewise look for a mentor who is within your peer group – same rank and file. You might find someone in your same job level who is a super-star employee and they can coach you in new and unique ways that you hadn’t even thought of before. Active listening is a critical skill that can help you become a master CEO of both your job and in your personal life. Many people are guilty of talking too much. Learn to listen attentively when talking to a colleague or when in a meeting. Do not just listen with the intention of jumping in and unloading your thoughts. Do not be high on your own voice. Genuinely engage in conversations and show attentiveness by nodding, paraphrasing, asking for clarification, asking open ended questions and maintaining eye contact when talking to someone. Having a pen and a note pad handy is highly recommended and you can write down key points of discussion. You can also take notes using your smart phone or an iPad. Later on reflect on your notes to improve your understanding and comprehension of the material that was being discussed. An interesting fact of life is that you can learn from anybody if you just take the time to listen keenly. Many people are guilty of talking too much. Please listen attentively. Ask for clarification. Write down a Personal Mission Statement for your job. This should be brief and specific and guide your daily work behavior. Think about challenges that are currently facing your department or the whole organization. Figure out what improvements can be made to increase efficiency. Do this out of your own internal self-drive, do not be focused on what personal rewards you will get in return. Others should be able to describe you using words such as Forward-thinking, Proactive, Persistent, Determined, Dependable, Resourceful, and Accountable. Naturally, as you work on solidifying your career growth you will face challenges and struggles both professionally and in your personal life. There will be moments of self-doubt, anxiety, low confidence, second guessing yourself and outright fear. Acknowledge that these bumps on the road are part of the journey. Establish a reputation as a go-to person who perseveres and solves problems. By consistently acting in the best interests of your company, your employers will notice you as a potential candidate for future promotion. Even if you don’t get promoted, all the key improvements that you do will be a boost for the achievements section in your resume. Actively ask for feedback so that you know the areas where you need to improve on as well as areas where you are performing well and can continue to improve on those things too. Seek feedback from both your boss and colleagues. As the leader of an organization, a CEO is regularly speaking up, making presentations, making decisions, offering suggestions, recommendations, giving feedback, brainstorming and asking questions. Likewise learn the art of making your voice heard and be comfortable with tactfully speaking up and asking respectful questions. When you have ideas and opinions, be confident enough to share them with your team in an objective and respectful manner. Seek out opportunities to be involved in brainstorming and offer your input and suggestions to keep the creative process moving forward. If you are in a meeting and something is not clear, ask for clarification to ensure that you understand what is being discussed. The caveat regarding speaking up is that you need to be able to determine the fine line between not speaking or speaking up too little versus speaking up too much. On the other hand when you speak up too much you run the risk of your voice becoming noise and you might alienate others and they could tune you out. It is vital to mention that many people do not speak up because of fear. It is ok to be afraid but you can still act in spite of your fear. The critical skill to master is when to speak-up and when not to speak-up, and to watch the tone of your voice when you speak. Another area where one can speak up is regarding promotions. When you feel that the time is right to ask for a promotion, and you have put in the groundwork to justify your request, then confidently and respectfully present your case for consideration to your boss. Learn the art of making your voice heard and be comfortable with tactfully speaking up and asking respectful questions. Change is a constant feature in many organizations. Change typically triggers uncertainty, discomfort and resistance in organizations. As a CEO of your job, put on your CEO hat and learn to do quick analysis to identify why changes have been introduced and what new benefits they offer over the former way of doing things. For example if a new system has been purchased and everyone was used to doing work in a certain way using the old or previous system, there is likely to be resistance to the change because of concerns such as a steep learning curve for the new system, transfer or migration of data, time, fear of the unknown, comfortable doing things the old way etc. You can learn to identify the benefits of the new change, become an early adopter and champion who will in turn guide and train others towards adopting and embracing change. Feedback lets you know when and where you are making progress and where you need to make adjustments, corrections or resolve problems. A good habit to practice is to proactively ask for feedback often so that you can use it to improve yourself. When receiving feedback, remember to thank the person who took time to give you feedback. Also use the opportunity to probe a little and ask a few clarifying questions to get the maximum utility or usefulness from the feedback given. Similar to how we appreciate receiving feedback from others, it is important to also reciprocate by giving others feedback. Give feedback in a respectful manner. Identify the specific behaviors and how improvements can be made, not an attack on the person. Feedback loses its power and effectiveness when allowed to go stale i.e. when feedback is given after a significant period of time has elapsed between when the actions being discussed happened. The risk of waiting too long to give feedback is that it negates the usefulness and relevance of the feedback, plus we are more receptive and able to learn and retain more immediately after a specific event or activity has occurred. Fresh feedback is always the best; it is high on impact, rich in value and is transmitted when the recipient’s antenna is positioned at the appropriate frequency and wavelength to receive and absorb the feedback you are broadcasting. It is advisable to give sensitive feedback in private. If the receiver is embarrassed in public through the feedback given they might not act on it thus watering down the value of the feedback. The path of least resistance is receiving positive feedback. This is usually in the form of encouragement. Always give sensitive feedback in private. Plan your day, every day. Know what activities you want to accomplish on a specific day and note these down on a “to-do list” or an activity list. Prioritize your tasks in order of importance and endeavor to do the most difficult tasks at the beginning of the day when you are fresh. Do one task at a time to the greatest degree practicable. At the end of each day, take a few minutes to reflect on what you did during day, what you accomplished and then plan what you will do the next day. Establish an email management routine that works best for you. You might prefer to answer emails at specific intervals during the day or perhaps due to the nature of your work you have to respond to emails in real-time. Write clear emails with distinct subjects/headings. Use salutation, proper punctuation and include your name. Use “cc” and “bcc” wisely. Above all be very discriminating regarding your use of the “reply all” button. Work colleagues are drowning from large volume of email and the last thing they need is someone replying to 50 people just to say “thank you” or “ditto” to one person. Organize your workspace to keep it neat and tidy. Minimize clutter on your desk. Regularly clear and trash clutter from your desk. Have a good filing system both online and offline. Keep your desktop free from chaos and only have a few folders to save important information. Ensure that your computer is doing regular back-ups of saved information. Schedule work blocks for yourself for doing critical thinking work, make deadlines for completing projects and activities, develop an ability of breaking tasks down into smaller, digestible pieces. Submit well organized, high quality work to your boss, colleagues and external stakeholders. How you dress and present yourself also matters. Invest in good and tasteful pieces of clothing, and dress one to two levels above your current job level. At the end of the day we all desire growth in our lives and careers. It is prudent to inject a dose of smart “showbiz” into you career every now and then. Granted by doing all the preceding steps in this article it means that you have been doing a lot of the “biz”, now it is time to change gears a bit and do some “show” so as to complete the showbiz equation. Before you reach out for your horn, reflect back on the work that you have been doing. Ideally you should keep a running log of your accomplishments where you write down the major activities and results that you have achieved within a certain time frame. For example the time frame can be a week or a month, where you could write down your major achievements in Week 1, Week 2 etc. or you can do it on a monthly basis where you write down achievements for Month 1, Month 2 etc. Quantify the achievements. Also think broadly and identify a correlation between your achievements and the overall success of the organization. Select an interval of time that you are comfortable with such as bi-weekly or monthly and email or present a one page summary of your major achievements within the month to your boss. This will enable your boss to be up to date with the wonderful work that you are doing. If your team or department has regular meetings where team members present on what major activity they are working on say for the week, you can introduce a little twist to this reporting procedure and not only report on what you are working on for this week but also report on 1-2 achievements that you accomplished last week based on what you had mentioned you would do then. A natural avenue for tooting your own horn is during performance reviews. During the reviews you have full license to self-promote and toot your horn as loudly as possible as long as all your “toots” are true. Another way to toot your own horn is by participating in meetings, surveys and focus groups where staff opinions are requested and offer in-depth well-thought out ideas and opinions that can positively shape and impact the direction of the organization. Offer to help others who might be struggling. By lifting others up your skills and talents get recognized by many. If you are particularly skillful in a particular task, for example you are an expert user of MS Excel, you can organize brown-bag meetings where you train other staff on tips and tricks on using Excel or any other software. If you are good at proofreading and editing let others know that you are willing and available to edit reports and proposals for them. Word will slowly spread around the office regarding your skills and your willingness to help others. Regularly update your resume with your current achievements. In addition, update your professional social media profile such as LinkedIn with your accomplishments. Request recommendations from colleagues and business partners and graciously give others recommendations when requested. Include in your profile your additional exploits such as awards and certificates of recognition. Finally, always accept compliments gracefully and say “Thank you”. A word of caution, if you push yourself so hard and do not include some downtime, you are likely to be in danger of fatigue, burnout and stress. Take advantage of vacation time and holidays to unplug and renew your body and mind. Before going for vacation finish off any major projects that you were working on then work with your boss and colleagues on a plan to ensure work continuity during your absence and make a deal that you will be offline and won’t be checking emails. Please remember to activate your out of office email responder and voicemail and identify who is next in line to respond to inquiries during your absence. Unplug also from social media during your vacation. Do things that you enjoy during your time off – it could be travelling, visiting family and friends, cooking, reading a book, exercising, hiking, camping, sleeping, resting, whatever makes you happy. Surprisingly, many great ideas and ‘aha’ moments occur when you are disengaged from high pressure work situations. When you return to work from your vacation, you will be refreshed and reenergized and ready to bring in fresh perspectives and creativity to your job. Also people are happier and more productive after a relaxing vacation. Before going for vacation work a plan with your boss to ensure work continuity in your absence. It is unlikely that you will always have all the information, knowledge or all the resources that you need 100% of the time to be able to perform your duties. There is always a degree of uncertainty and vagueness that you will encounter from time to time in your job. On the other hand very few things go according to plan. There are usually emergencies, contingencies, missed deadlines, last minute requests and uncertainties. There will also be times when you might have to work long hours, nights, weekends, or holidays to meet deadlines. Navigating through the fog of ambiguity in the absence of a step by step roadmap requires confidence in yourself, trusting your gut instincts, out of the box thinking, sharp awareness of the big picture and vision and being flexible enough to make quick decisions and quick course corrections. Have confidence to set sail in the ocean covered with fog where even though you cannot see beyond your ship, in your mind’s eye you have a sixth sense on which direction to go then you make a decision and start sailing. Sometimes your sixth sense could be incorrect and you find yourself sailing in the wrong direction, you need to be flexible enough to change course and don’t beat yourself down. Understand that not all the decisions made in the face of ambiguity will be correct decisions. The goal to aim for is to overall learn how to make more correct decisions than wrong ones. In addition, use the power of leverage by asking your boss and colleagues questions to find out if someone has previously gone down the ambiguous path that you are facing and what solutions did they come up with. You can also do online research to seek more answers and save yourself as much time as possible from reinventing the wheel. It’s unlikely to always have all the information that you need 100% of the time to perform your duties. There is always a degree of uncertainty and vagueness that you will encounter from time to time in your job. Few things go according to plan. There are last minute requests, emergencies and uncertainties. Be flexible to meet tight deadlines. How to think like an entrepreneur is one more skillset to explore in the quest of becoming successful at your job. The trademark of an entrepreneur is their ability to take a risk on turning a passionate vision into a reality. Key characteristics of entrepreneurs include: looking for new opportunities, taking smart and calculated risks, ability to inspire others on their vision, controlling emotions and being calm during crisis, optimism, crisis management, persistence and determination. Knowledge of the details as well as the big picture and identifying what to delegate to others, avoiding paralysis of analysis and making bold decisions, communicating clearly and confidently, a sense of humor, getting their hands dirty, commitment to quality and excellence and focus on customer satisfaction. In an endeavor to succeed in your job, you can replicate and adopt some of the key characteristics that help entrepreneurs to be successful. You can learn how to manage your emotions and be cool and calm. When faced with a difficult decision, you can choose to sleep on it and review it in the morning with a fresh pair of eyes. You can also adopt a laser-focused commitment to excellence in everything that you do while at the same time not being afraid to get your hands dirty by doing what it takes to achieve results. One way to think like an entrepreneur is to look for new opportunities in terms of seeking ways to expand your current role. Identify new tasks that need to be done and identify gaps in the organization that would need a skilled worker and position yourself as that person. Present this need/gap to your boss and other senior managers in a clear and well-thought out manner that is a “win-win” for both yourself and the organization. You could end up creating a totally new job for yourself. Another way to think like an entrepreneur is to think about the long-term succession plan of your current job and train someone else to learn your job. You should not be the only person who knows how to do your job. If an opportunity for a promotion arises, it is much easier to transition upwards when there is already a trained successor ready to fill in your shoes. The trademark of an entrepreneur is their ability to take a risk on turning a passionate vision into a reality. Adopt a laser-focused commitment to excellence in everything that you do – big or small. I have saved the best for last. Relationship Building is the most important skill for anyone who wants to succeed in their job. True success is the result of working with and through others. You can only achieve so much by working alone. Also nobody likes a lone ranger. You will always go much farther and faster, when you learn how to work well with others. People help people. By working with others you draw upon the principle of Synergy where the whole is greater than the sum of its parts, the 1+1=3 effect. Make a genuine effort to build strong working relationships across the organization, not only within your department but also outside your department. Go a step further and build relationships with your organization’s stakeholders such as customers, vendors, suppliers etc. know and understand the needs of each of the constituents and constantly think of how you can offer the best service to both internal and external stakeholders. Actively “seek opposites” – working with and hanging around like minded people is ok, but to grow and stretch yourself exponentially, actively or subconsciously seek out the company of people who are different from you, people who think different from you and have different life experiences. Learn from them, test your theories and thoughts through them, bounce around ideas, sharpen perspectives, and catapult ideas to a whole new level of possibility. Reach out to others and help whenever you can. Offer sincere praise. Be happy for others successes and celebrate others. Remember people’s names. Remembering peoples name and using their names makes them feel special. Remember people’s work anniversaries and birthdays and send a simple email saying “Happy birthday” or “Happy anniversary”. Have lunch with colleagues and get to talk about various topics. Say hello to the security guard and the cleaning crew. Be especially kind to them. Say hi to other people working in different organizations within your building. Investing in people is a key skill that will serve you well in your career. Wishing you the warmest best wishes in your career. Learn great ways to be successful at your job. Tips include coping with ambiguity, self-promoting smartly, boosting work output, embracing change, having an entrepreneurial mindset, doing self-evaluation, learning from mistakes, being self-driven, seeking feedback and mentorship.